Your website is just that—yours. You’re a unique individual with a business that delivers services in a way no one else can. Sure, your website should be informative and speak to the benefits of your service. It should also be a place where your audience can get to know you and connect with you. 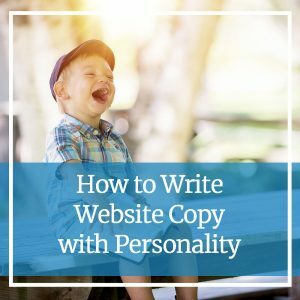 The best way to drive this connection is by infusing your personality into your website copy. Boring, standard words don’t work anymore and yet, they seem to be everywhere. Now’s a great time to stand out from the crowd by using personality to build relationships that lead to those coveted conversions. Write formally. There are some instances where formal writing might be useful. However, most of the time, formal writing doesn’t connect at all with your reader and should be avoided. Create proper paragraphs. In school, we’re taught that good paragraphs, true paragraphs should have at least four or five sentences. When you’re writing for the web, however, five is simply way too many. Shorter paragraphs help readers skim better, and one-sentence paragraphs can be just what you need to grab a reader’s attention. Write in the third Although third-person has its place, it’s not the best option for true connection. First-person the most direct, personal point-of-view, and it pairs extremely well with second-person, which allows you to speak directly to your reader. This is exactly what your website copy should do. So, where do you start? To create a website that truly connects, here are a few key things to keep in mind. Before you type a word on that page, you need to first consider your audience. If you’ve done your research, you might know who your target audience is. If so, take a moment to consider their emotions and the way they might perceive your content. While reading, you’ll want to make sure your content speaks in a way that connects to them without pushing them away. Who are you in real life? What are some of your unique quirks? Do you love Disney? Are you a coffee aficionado? Use these quirks throughout your content to connect with your reader. These pieces of your personality will showcase your humanity to your audience, making you relatable. If your audience can relate to you, they’ll find it easier to reach out. Are you the funny one? Showcase that in your content. Are you serious and to the point? Your content should reflect that, too. How do you speak in real life? Chances are, you don’t speak without conjunctions and you might even use unique terms that others find endearing. You’re not a robot and you shouldn’t write like one. Are you gentle? Are you passionate? Are you sarcastic? There’s nothing wrong with a sprinkle of your true voice in your written word. Need Help Writing Personal Content? You’re In the Right Place! Are you struggling to find your voice when writing? Can’t seem to create website content with personality? You’ve found a team that can help. Reach out to Custom Content Solutions by calling 612-643-1824 or send us a message online.